Have you ever taken a screenshot? of course, everyone having a smartphone knows how to take a screenshot in order to capture something crucial. Not only for any casual purpose, but the screenshots are very important in many situations such as sending the proof of paid bill & compatibility of a website with various resolutions, etc. For serving these purposes, you need a more powerful tool that generates screenshots of all resolutions according to the requirement. In this era of Smartphone, anyone can take a screenshot with finger gestures or pressing some keys altogether. However, it is not that easy when it comes to the PC. Every computer system is assigned with different shortcut keys to take a screenshot. Also, you need to open the paint tool, paste the image and then save it. This is a confusing thing & you cannot get the screenshot as per the required resolution. Therefore, a more powerful as well as the easy tool is required for the accomplishment of this task. The tool enables you to take quickly a screenshot of any website within seconds; the tool is a single shot generator with the only requirement of website URL. Once screenshot successfully captures the page, you can download respective PNG image format. There will be no names or watermarks are added to the image and completely it is free to use. A website screenshot generator is an innovative tool that comprises many features that you cannot avail in a normal screenshot. If your website is facing any problem while opening in tablet, smartphone or PC resolution, there is no need to get these devices physically, if you have a screenshot generator tool. This is basically an online tool that you can find in some websites. Just open the site, add your URL and get the screenshot. There is no need to open paint application, cropping and then saving. There are two ways of taking the screenshot of a website i.e. The process of taking screenshots with the help of a website is simple. You need to enter the URL and it will generate the screenshot. Different screenshot websites have different functions. Some of them are simple whereas others let you decide a resolution and saving in various file formats. If you don’t want to access a website for the purpose of screenshot generation, it is advisable to use the browser extension. For instance, open the chrome web store and search screenshot tool. A big list will appear. Choose a tool with high star ratings to install it and use for instant screenshots. For using a browser extension, one must be on the same webpage that they need a screenshot. On the other hand, you just need a URL for taking a screenshot with the help of a website. If you are looking for a reliable tool to generate the website screenshot, then this is the tool for you. These are many top 10 screenshot generator tools that you will find while searching on Google. While exploring further, you will find many other options, but this list is enough to satisfy your need. Why do we need a Website Screenshot Generator tool? It may help in the promotion of sites in various image sharing site and presentation of your business model to the clients. Taking screenshot is much easier in today’s internet world and will help to take website screenshot without buying software or installing the addon. It is required to use it on website blog or helps to share web page screenshots easily on social media’s. If the people like and shares the web page screenshots on social media, the chances will increase organic seo traffic, Click Through Rate(CTR) and generates quality leads. The end user means the last person for whom the entire website is designed. If someone is facing an issue with functions while opening a specific page link, they report it to the website owner. Rather than explaining everything in writing, it would be better to capture a screenshot and send it to the developer's team. A screenshot of the website can easily illustrate the problem. Before launching a page on the website, it is important to make sure that there is no compatibility issue from the perspective of resolution. Nowadays, internet users are accessing websites through their desktops, tablets, and smartphones. All of th4em have different screen resolutions. Your website must be flexible enough to adjust in all resolutions without losing then functions. Before launching any page, take some screenshots with the help of an online tool in the resolution of all devices. If there is an issue with the user interface, it can be rectified much earlier before receiving any complaint from the end user. In this fast-moving world, digital wallets are replacing hard currency rapidly. However, you need to keep the record of every transaction done through digital wallets. It is a kind of proof that you paid the bill or transferred money to another account. Therefore, a screenshot generator tool can help you in sending such kinds of proofs right after the payment. The captured image contains a reference number, account number, transaction ID and many other things as proof. If you want to capture something live on your screen, a screenshot generator can help. It can capture the images before the live screening disappears. While live streaming, if you want the shot of a specific frame, just pause it, take the screenshot and play it again. The main purpose of every website is to satisfy the end user. Whether the website is selling products, services or it is just meant for the informative purpose, everyone expects maximum traffic to generate revenue. If the users are not able to access all functions of a website conveniently, the bounce rate of your website will automatically increase. For instance, most of the websites are developed on the desktop PCs, thus; their resolution perfectly matches the size of a desktop. However, the maximum number of internet users of current times are accessing websites and apps from Smartphones. Therefore, the flexibility of a website according to multiple resolutions are essential. Organic SEO and paid marketing are the two ways of marketing a website. Both of them exhaust money as well as time for accomplishment. If your website is well optimized according to the parameters for SEO but not designed perfectly, all efforts of hard work will go worthless. Your website may come at the topmost rank but cannot gain traffic as per the expectation. If the front end interface is not user-friendly, nobody will visit there again. Therefore, website screenshot generator tools are important. They capture the interface of a webpage in all resolutions to give you the real-time results. 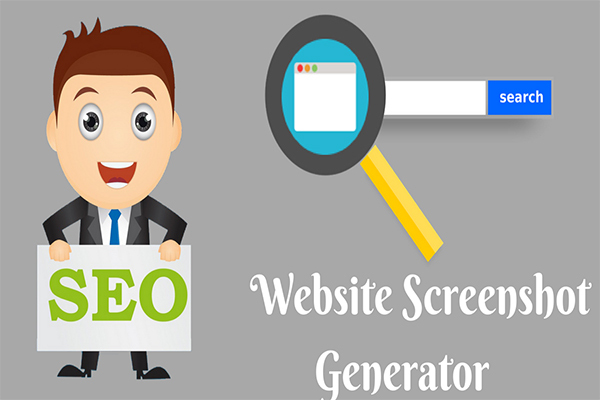 How to use Website Screenshot Generator Tool? Take an important screenshot of favorite websites immediately with the help of an URL. You can take a screenshot as many as you want without registration for unlimited websites, just enter a URL and click submit button within seconds your screenshot will be generated and will be ready for download. First of all, open any online tool that can generate the screenshots. For instance, open the URL in your browser. On this webpage, you will see a blank section asking for entering the URL. Type or paste the URL and select your device from available options such as desktop, tablet or smartphone. Some tools also provide the options of customizing screenshot resolutions such as 1024X640 or 320X300. After setting every option according to your requirement, click on the “generate screenshot” button to initiate the process. The screenshot will be generated exactly as per the instructions are given. Along with the image, you also get the link of screenshot image so that you can use for embedding or sharing. If you have a multifunctional website screenshot generator tool, it can be very helpful in many concerns. Here are some advantages that you must know. There is no need to get devices of multiple resolutions if you have a powerful screenshot generator. This tool acts as a free of cost alternative. It is capable of taking the screenshots of websites in all resolutions whether it is a large desktop or portable smartphone. If you notice an error the front end user interface, it can be rectified instantly. For an SEO executive, it is very important to know that the targeted content is reaching to end user without any issue. If the end user is not getting the purpose of a website properly, are practices of marketing are worthless. You need to check the interface of a website as an end user rather than a marketer or developer. Therefore, a tool for generating a screenshot is a better option. As a user of the website, if you are facing any difficulty in accessing it, sending a screenshot to the development team is the easiest as well as the most logical way to convey your message. Fast and easy way to take screenshot easily without the need of technical difficulties. You can use for commercial and personal use without registration. It will help to take an exact screenshot of your website. Available 24/7 all the time and very reliable tool. No need for software or installing browsing extension. All the screenshot is completely taken online. The tool for generating screenshots may not seem too useful at first sight, but it has great significance. If you know the right use of screenshots at the right place, it can simplify many issues instantly.